Claim: Climate Change Contributed to Children Being Trapped in the Thai Cave Flood | Watts Up With That? My climate journalism model suggested the attempt to link the tragedy in Thailand to climate change was inevitable. By now, it’s well known that their predicament was caused by rising floodwaters in the cave. What is less known is that the pattern of precipitation that ensnared them is in keeping with broader changes to the region’s seasonal monsoon that researchers have attributed to climate change. No one is suggesting that climate change itself was responsible for trapping the boys in the cave. But what has changed in recent years is that those wet periods have been wetter. Those children were trapped because some idiot led them into a dangerous cave system in Wet Season, not because of Western CO2 emissions. In my opinion it is shameful but predictable that a mainstream Western journalist would think it appropriate to trivialise the suffering of those Thai children, to promote their climate cause. Although all the children were thankfully rescued, there was a fatality. Former Thai Navy Seal Saman Kunan died during the desperate effort to maintain oxygen levels in the cave while the children were still trapped. July 12, 2018 in Alarmism. Well – the wet season got wetter. It certainly must have been a surprise that it is wetter than the dry season! Someone in the PC business must have forgotten the definition of ‘wet’. An engineer at work told a coworker that high humidity levels in the air will not change the evaporation rate of the evaporation pond, as the level kept rising, the engineer continued to blame the spray pump. I propose Worrall’s Law. It’s similar to Godwin’s Law. I demand you publish the code! So the climate scientist suspected there was something wrong, obviously. I belong to a couple of Scam Baiting and Warning groups, our General Law of Scammers is similar, as soon as there is a disaster, there will be a scam using it. The morons are running riot. We on the centre right don’t do protests but it’s kinda like they are pushing us to. God help the stupid twits if that happens. If we do hold a protest, we will no doubt clean up after ourselves. Can’t leave that sort of thing for Gaia to take care of. So, precisely WHAT degree was it ‘made worse’. What minute fraction of a degree was the difference? MOre like Musk’s Law in this case. We should have a prediction section in WUWT using your model. It would likely be quite skillful. The event needs to be big in the news and 8t has to be dur8ng a period of hot, cold, wet and dry weather! What 8s up w8th your keyboard?? Climate Change™©® is making his auto correct worse..
Just a galloping case of FFS. (fat finger syndrome). It got 8 by climate change, of course. Drat … should have read lower, I got beat to it. Any adverse event that has a weather component to it is now “TheMagicMolecule increase made it worse” for the brain-dead Leftist journalists. No prediction AI algorithm needed. Cyclical reasoning injection only requires them to need a singular indoctrination with occasional booster shots. The oral version tastes like kool-aid. No? Isn’t that exactly what Kendra P-L is suggesting in the previous paragraph? It doesn’t really help the cause of sceptics when they can’t even decipher correctly, and they completely misrepresent what is said in an article from which the words are right before our eyes..
Maybe if you actually stated what was misrepresented in your opinion, your comment would have value. Don buddy, if you’re making an earnest comment rather than a drive-by cut down, please go to weatherbell.com and view today’s update for Fri 13. Joe will show you why the monsoon pattern travelled northward and was predicted before it happened based on history and good meteorology. You will also learn about “climate ambulance chasers”. “I wouldn’t be surprised if…….” referring to a whacko conspiracy theory alleging a deal between the retiring Justice and Trump that would rid him of the Russian Investigation. The important thing is Chuck didn’t actually accuse Trump of doing this, but he planted something in the minds of the useful idiots that will reverberate for week in the MSM. Just more flak from the folks who haven’t yet figured out why their platform didn’t win the last POTUS election. I think the term idiot should be reserved for those activists and politicians who are leading millions of people into an equally dark and dismal abyssyes that has already resulted in an unknown number of deaths of those unable to escape the consequences of unaffordable energy prices. Unlike such people, the soccer coach was able to provide inspiration and comfort to those he was responsible for in order for them to be rescued by those who had the confidence and support of all the worlds population. On the other hand those that have the foresight and courage to be able to lead us all out of the darkness being imposed on us are ridiculed and slandered by the blind who are being lead by the blind. I think it reasonable to describe someone who leads kids into a dangerous cave system in wet season as an “idiot”. However if I was one of the parents of those kids, I might take his subsequent actions into account when deciding how to respond to his idiocy. An idiot can at least partially redeem himself by not making a horrible mistake even worse. He gets credit, I think, for not making things much, much worse. News reports said the kids had been in this cave numerous times and were familiar enough with it that they knew where the high ground was when they got trapped by the water and made their way there. They apparently had a little bit of light from the flashlights they had with them, and the coach taught them all how to meditate and calm themselves down, although the youngest of the kids apparently had some difficulties with anxiety and cold. Can you imagine the moments when the kids realized there was someone in the dark water coming towards them, and imagine the thoughts of the first diver to stick his head out of the water and sees all these young kids alive and kicking! They said one of the main pumps lowering the water levels in the cave quit working soon after the rescue was completed. There will be at least a couple of movies made from this incident. The kids will make themselves a little money. Ironically, he ultimately and unwittingly brought them all to global celebrity. Short as the world’s attention span is, they should cash in on this immediately. Eric, the adult went into the cavern and saved the boys, who had gone there on their own, according to the story. There are conflicting reports. Some say the junior coach went in and the senior coach noticed the group missing. When he got there, all he found were the bicycles and packs. I really don’t know what to believe. On Seattle news radio they actually said the rescue was made somewhat easier because of the LACK of expected rains. Commercial meteorologists from the United States were making forecasts to support the rescue efforts. That was part of the explanation of the “lack” of rain while rescue efforts are underway. So what you’re saying is the climate change has delayed the usual rainy season in Thailand, potentially creating a vast new Southeast Asian Desert? Chinese CO2 doesn’t count, CO2 from designated “developing countries” is somehow less harmful than Western CO2. Surely you mean completely harmless? “Western”, “white” generated CO2 is virtually distilled evil. Make no mistake, CO2 generated by affluent societies is a source of revenue for third-world dictators who have maneuvered to the front of the UN pack. Eric, human CO2 emissions barely count at all in the big climate picture anyway. Don’t think on their level. It just lends legitimacy to their “CO2 is the control knob” suppositions. While your call-out here is justified, it is misplaced. Ms. Kendra Pierre-Louis is a climate (science) reporter for the New York Times. The original article was part of the Climate Fwd: newsletter published 11 Jul 2018. The Sydney Morning Herald published a silly article, but they borrowed it. Ms. K. P-L. is a climate-alarm activist and a climate-change propagandist by trade. She has abandoned the realm of ‘reporter’. Find a high profile news item that has simething to do with weather and use climate models to find a way to blame it on fossil fuel emissions. It’s called Event Attribution Science. When all you have is a hammer, every problem looks like nail. Took me a while, but I got it eventually. I have taken kids under 12 into caves, some with such a low ceiling that I was scraping back and belly for 6 m or more. The kids were way up the front going like stink. They love it! I too knew it would not be long before dishonest alarmists would eagerly blame another tragedy on climate change. Last time I checked Climate Change was going to stop the Monsoon, not increase it. This article is really measured in that it points out that agricultural practices are more important than climate change in cropping. The decision to place these children in such jeopardy was inconsidered. The reason was to celebrate a birthday. Having been a member of a Speleological Society at Uni there was careful appraisal of survival in caves. The limestone above them is quite porous leading to poor plant cover and flash flooding. I missed one such trip to the Bungonia caves, where members stood in neck high water for six hours, but survived. Just imagine when this floods. Time to wake up-the climate whipping boy WILL be used to persecute political enemies. As “climate change” is an unqualified term, it means nothing, but at the same time means anything you want it to. It WILL be used for political persecution- just like witch hunts of old. Predicting how liberals will blame climate change on everything bad is much easier than predicting climate change. Liberals behave much more erratical than any known variant of climate change. Coach Ake (Ekkapol Ake Chantawong) – 25 years old, kept the incredibly brave and resilient young soccer players safe inside the cave. Here’s a bit about him: He lost his entire family when he was just 10 yrs old. He became a Buddhist monk, and was raised in the monastery; he now devotes his life to young people and to the boys he coaches. Inside the cave he taught the boys to meditate in order to stay calm and to conserve their energy; he helped them to keep their spirits up and he refused food – instead giving the boys his rations. His aunt says that she knows he is probably blaming himself. The parents of the trapped boys say “We will heal his heart”. *There is some confusion around this…Ake did not “lead” the kids down there…he went down to find them and a flash flood came and caused them to find a safe space deeper in the cave system. I urge my fellow human beings to discover your empathy and at the very least – study the situation before unleashing outrage on someone who does not deserve it. 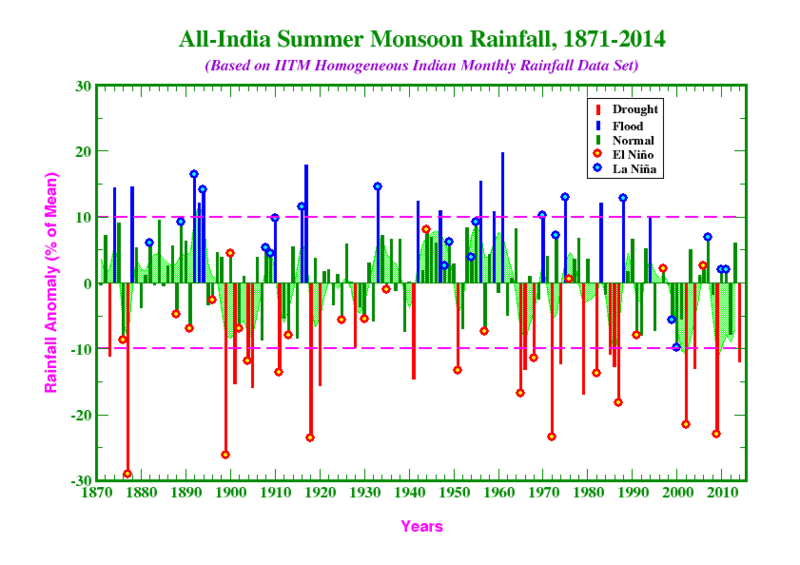 All India Summer Monsoon Index. also doesn’t support this fear mongering journalistic idiot. It continually amazes me that climate change is often blamed for some problem in an area where there is no evidence that the climate has changed. It appears that just the ‘idea’ of climate change is having a huge disruptive impact on the nature of things. No physical change is required to cause vast physical problems! Brilliant – a chart that goes through 2014 as evidence on an event that occurred in 2018. You’re essentially claiming that “anthropogenic climate change” started in 2014, so you’re an idiot. 148 years is more than long enough to establish a long-term trend, and that trend is down. So you’re tacitly claiming that your fairy-tale “anthropogenic climate change” has suddenly caused so much environmental change in 4 short years that it over-rides the long-term trend… so you’re an idiot. It has been pointed out before that some bad outcome being ‘in keeping with’ (or ‘consistent with’) their hoax-theory, has all the scientific rigour of pointing out that the outcome is ‘consistent with’ the malice of witches. Not all that long ago in the West and right now in some parts of Africa, the apparent problem was approached by rounding up a bunch of old ladies who were ‘in keeping’ with what they thought witches were like and burning or stoning them to death. Today, the perpetrators of this climate hoax-theory and their useful idiot supporters in press and politics are belieted by many. But the more stupid their claims, the more people will eventually realise they are being hoodwinked. Eventually the truth will be admitted. But will the perpetrators and their supporters escape punishment? There is now no known event that any Western journalists would not think it appropriate to trivialise by attributing the event to Climate Change/Global Warming, in order to promote their dear deluded climate cause. For example, “Britain’s loss to Croatia in the football was caused by Climate Change”….T”he loss of Malaysian Airlines 370 was caused by Climate Change”….and on and on and on…..
I’ve read that the entrance to the cave has a sign warning about the consequences of heavy rain. Forget it. There are more and more analphabets due to AGW. You can bet on it. Eric wrestling with these phantom strawmen of his again. What a contribution. Go read Eric’s piece again. This time switch brain on. hmm, did Nick change his name? Donald. get with it man. is your comprehension so low or are you so accustomed to sophism that you just accept it now. We all know exactly what the author is suggesting. With a bit of luck there might be another fatality coming out of this sort of soulless, opportunistic drivel and that is the reputation of the climate alarmists as the most vile, amoral, selfish, self promoting scum on the planet (well in a tight race with ISIS). Swamp the letters to the Editor of the MSM with excoriating letters, tweets to the msm talk shows etc seems to be the way to go. A hastag calling these swine out #YouToo??! might be worth a go. Komrade, you’re slip* is showing! So, what they mean is that “weather, not climate” caused the cave to flood, but, no mention of a careless man for taking the children into the cave prone to flooding during the rainy season; which would make the situation a “man made” event. Of course it was climate change. And CO2 is the Satan of the New Religion. never let a good story go which can be exploited. Shows a small rising trend in temperature and June to September rainfall. Correlation value positive 0.51. Young boys love adventures and MYSTERIES. In thousands of years of Thailand settlement there must be thousands of juveniles lost in that caves never found again. Their parents relieved their grief with thinking that sons ‘rode into sundown’ ‘living in a better place now’. Thai government promised to let this never happen again. Of course. Climate change affects everything, even contradictory things. Which is why it’s not science in any way. Not bragging but I thought of this happening about two days after I first heard of this story. I also told my girlfriend after the 1st 4 kids were rescued that there will be a movie about this someday. “Recent years” is weather. Recent decades is almost climate, recent centuries would qualify as climate. The only thing is, climate changes on its own. How can you tell which did what to who (or who’s on first, for that matter)? In other words, a fibber. I used to fly over that exact same country in the mid-1960s during the war in Southeast Asia. This is the time for the wet monsoon in that part of Thailand. Absolute clown. Where was this prawn when we had 13 monsoons come through in one season in 2005? Chiang Mai partially flooded 3 times in 6 weeks. My house was inundated each time. No one thought it was Climate Change then because it had flooded like that about 50 years beforehand . Much of the city flooding was more to do with poor dam water level control than a half degree change in temperature! The wet season is wet. Period..! Ek is not an idiot, just he has been to the cave many times and made a mistake. He knew the cave floods during the rainy season but did not know that the water inside the cave can rise so fast in just less than an hour AND that that fast rise becomes permanent until November when the water levels finally go down. Maybe, just maybe, would entering a cave prone to flooding not be the cause of all this?